I'm running Mint 13 LTS (Ubuntu 12.04 LTS) on a Lenovo ThinkPad with 4 Gb of memory and 240Gb SSD drive. Of all the audio players I've tried, Audacious is a) the one that actually works and b) close to the behavior of (and even better than) WinAmp. I don't care about skins (and WinAmp had a lot of great skins), but I love the playlist functionality of Audacious which is even more straight-forward than WinAmp. Audacious offers a more natural interface than Banshee, Rhythmbox, or the M Players (GNOME MPlayer, plain old mplayer, etc.). I got myself into a situation where Audacious Player audio no longer worked. I was able to hear output from jt.france2.fr on-line journals after unplugging my headphones (so, the sound coming from notebook speakers), but not Audacious, which had been working. Determine that I need to go remote with my notebook. Close up all browsers windows carefully to ensure that when reopened, I get the content (pages) I want. Close up all other applications. Remove from dock, then use remotely as desired. It starts on notebook monitor, with projector, etc. Shut down when ready to return to office and dock. Reinsert into dock and start normally. Big monitors will work. Note that I use ThinkPad notebook at work with two Hewlett-Packard 24" (1920×1200) monitors run from a simple dock. I need to take it remote to conference rooms and other settings, mostly for doing code reviews. I've never liked doing this because of the mess I'm left with having to switch from the notebook monitor/projector back to my dual monitor set-up. The symptoms were basically that my wireless headphones would not work. pavucontrol installs in whatever language is current (Cinnamon). If you were playing with languages and don't like the one it was installed with, uninstall, then reinstall it. I found a blog post detailing how to convert Windows Media files (WMA) to MP3. I have an audio book of Tolkien's Silmarillion and I haven't been able to listen to it in my car. Here's a script—the for loops of which I mostly plagierized directly from that post. You need mplayer and lame on your host. echo "mplayer is not found on this system!" echo "lame is not found on this system!" mv "$i" "`basename "$i" .wma`.mp3"
mv "$i" "`echo "$i" | tr '_' ' '`"
A question on refresh speed. My nephew can be thanked for this answer. "I have considered then that 120Hz is the minimum acceptable rate for large-screen televisions, but that rate is never/rarely seen on smaller screens (under about 46"). "What can you tell me about this? For example, what am I losing watching Blu-ray on 19" 60Hz LEDs vs. my 47" 120Hz LED? If I bought a mid-sized unit, is that still going to be the same experience as on my 19" TVs?" "The 120 Hz refresh rate is most often taken advantage of by Blu-ray action movies. It provides a smoother experience and is often seen by most people to be slightly nicer on the eyes when staring at the screen for long periods of time. I admit I can tell a difference between the two, but I will also admit it is very minute. I have a 60Hz 40" Samsung and it works beautifully. The 120Hz refresh rate is more of a luxury than any kind of necessity. You probably won't notice much of a difference. It might as be interesting to note that 240Hz is often seen as too high giving a "fake" look to the video. "If you're willing to spend the extra money and get a really nice TV, I would recommend 120Hz, but 60Hz on a 40" TV should be fine. I doubt you'd notice much difference by going to 120Hz. "Most TVs are only 120Hz at higher screen size because the manufacturer think that if a consumer is going to spend the money to get something that big, he probably doesn't mind spending the money to get a higher refresh rate. At smaller than 48", the cost-to-who-cares ratio is too low to make it worth making a 120Hz screen." What is the "digital copy" disk on the DVD set? A question about DVD/Blu-ray packaging answered by my nephew. "What is the 'digital copy' disk on the DVD set of, for exmaple, Narnia: The Voyage of the Dawn Treader'? In this set, there are two disks, the DVD and this second disk I've never paid attention to. "Should this disk simply contain what I would otherwise be ripping using Handbrake?" "The set contains a file, probably in .m4a or .wmv format, and of the movie in DVD quality. Theoretically, you can stick it in your computer and have an instant digital copy of the movie. In reality, the file requires you to sign in, sign up, sign away your firstborn, and then it'll let you download the file—a file with so much DRM on it that almost nothing on this planet can play it. "You can always try throwing the disc into your drive and see what they have to offer, but I've never had a good experience with those digital copies." These are details oriented especially to my Audio Unlimited® 900MHz Wireless Transmitter and Headphones. 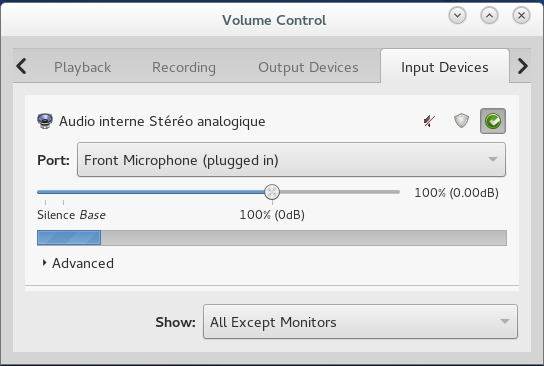 And, yes, for some reason, under Linux Mint Sound Settings, plugged into the front TRS jack on my Dell notebook dock, it's Headphone USB Audio that I must select. See details below. 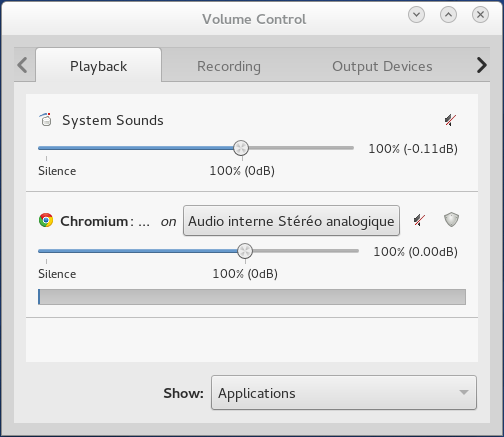 Switching back and forth between Speakers Built-in Audio and USB Audio Headphone often clears the problem of no-audio. 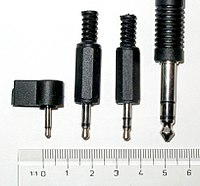 * TRS, tip-ring-sleeve bayonnette connectors (and sockets) come in 2.5mm monophonic (TS), 3.5mm monophonic and stereophonic (TRS), and also (legacy) ¼-inch stereophonic phone connectors. ✓ support of TRS-connected headphones. 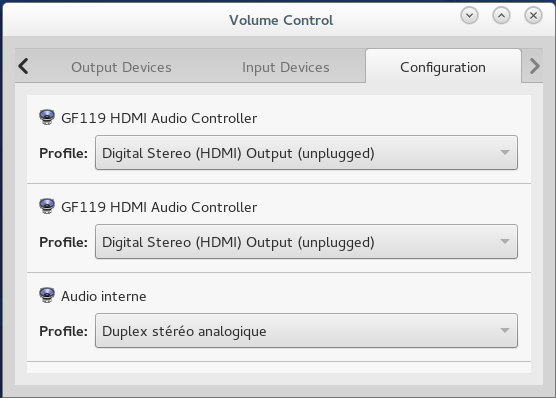 ** On Dell (Thunderbolt and non-Thunderbolt multiplier) docking stations, audio only works on the front (not rear) connector whether under Linux or Windows. I just stand the headphones upon their charger each night before leaving work and then put them back on the next morning. 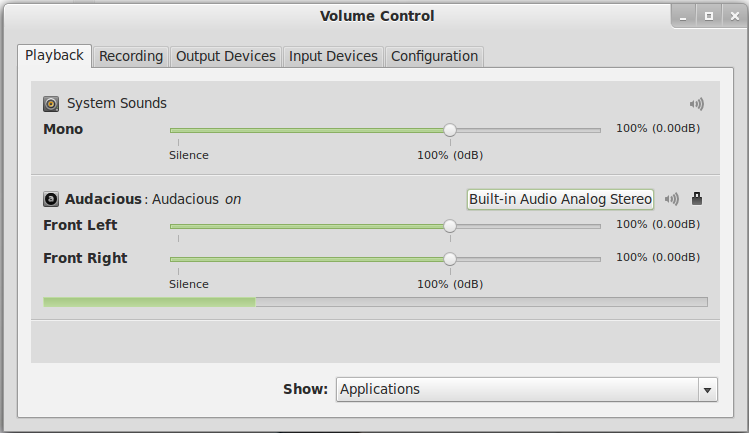 Sadly, I find the Linux Mint Sound Settings to be very touchy. If ever I launch Windows in a VM, my audio (input and output) settings are torched and, to restore them, I must often even reboot after downing Windows. The details are for the Avantree Audition Bluetooth Headset. 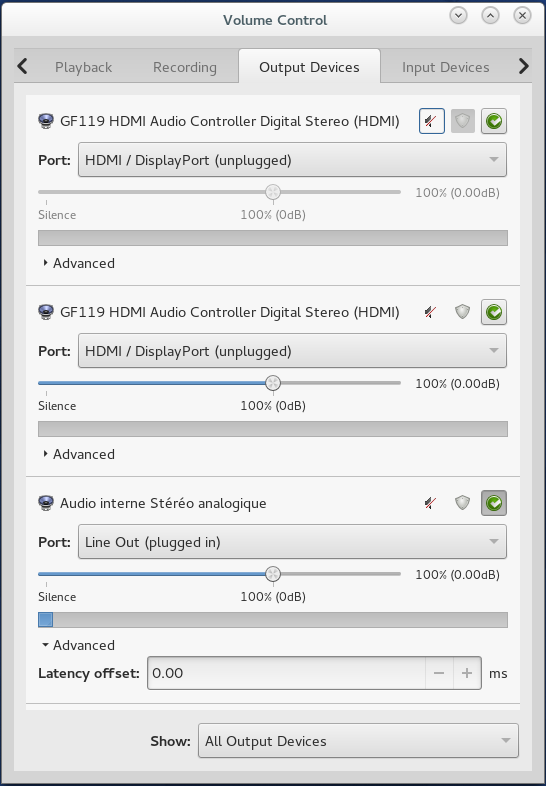 I show Avantree Audition Headset alongside Speakers Built-in Audio in the Cinnamon Sound settings, Output tab. I also show it (as the only device) in the Input tab. Unnecessary to charge every day, but doesn't hurt. They are rated at 40 hours and I've probably got about that out of them, but there aren't super concrete signs they're juiced out. They just stop working (but that could be due to a loss of audio setting). Connect to Bluetooth as directed. 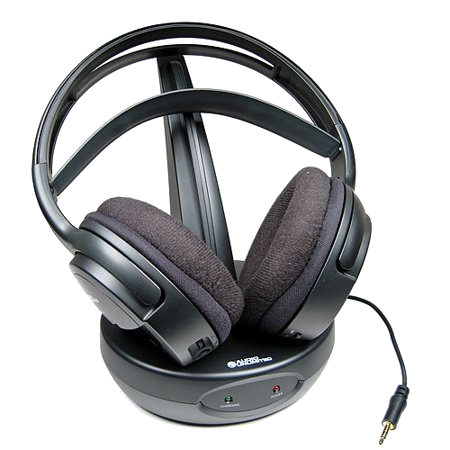 In morning, press center button/bar and hold until rising tone is heard (means "turned on") and the headphones are connected (the Bluetooth configuration will say, "Connected"). In evening, press center button/bar and hold until descending tone is heard (means "turned off"). and the headphones are connected (the Bluetooth configuration will say, "Disconnected"). In either case, to enter "discovery mode" for Bluetooth, press and hold center button/bar longer still. There is a flashing light on the headphones that goes from blue to red (or something—see the headphones guide) indicating discovery mode. I find that the Avantree Audition microphone works fine, I just set it up using the Linux Mint Bluetooth configuration applet from the Cinnamon panel. 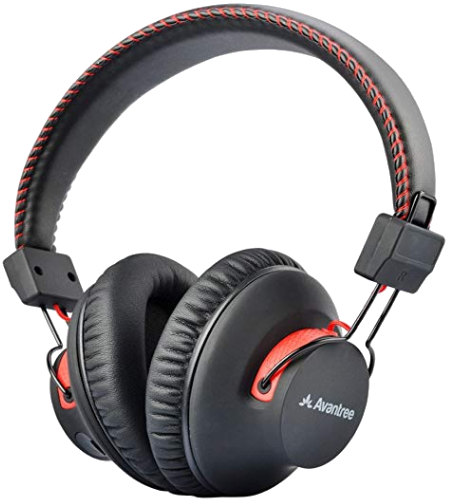 ...as I have to run Windows 10 in a VirtualBox VM and Skype for Business, I find it's very hard to get the headphones back into decent sound after dropping my Skype call. I have a better experience leaving the built-in microphone to do the job of input and just not mess up my headphones. This said, most of the time Windows in a VM still trashes my sound settings.